Just Prague. I wish you can see this in person. 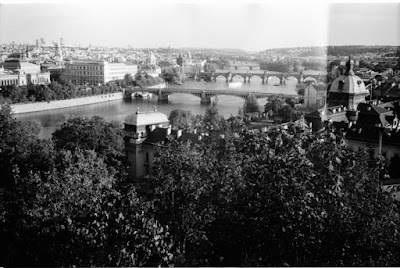 If you're ever in Prague for a vacation longer than a few days don't miss Letna park and this spectacular view. There's a restaurant right at this spot. Actually it's quite close to Prague castle so this would be a nice place where to spend a relaxing evening after the walk at Prague castle. Speaking of Prague castle, I would mention that it is open till 1 AM and there is a lot less people than during the day (as anybody can guess :). Thanks to that I have a night photo of St. Vitus Cathedral which I'll post sometime later.